The Law Society has failed in its bid to strike out a negligence claim by a law firm that was the victim of a fraud after the details of another firm it had checked on the society’s online ‘Find a Solicitor’ (FAS) facility turned out to be false. Upholding the decision of Mr Justice Mitting, the Court of Appeal ruled that there were too many questions of fact to be determined to make strike-out or summary judgment appropriate. Lord Justice Beatson, giving the main ruling in The Law Society of England & Wales v Schubert Murphy  EWCA Civ 1295 , said: “Notwithstanding the undoubted difficulties in establishing that a regulatory or professional body owes a duty of care to its members or to the public, the determination of whether a duty arises in the present circumstances is fact-sensitive. “It requires the answers to several questions which cannot be determined without further inquiry into the facts. He was joined on the high-powered bench by the Master of the Rolls, Sir Terence Etherton, and Lady Justice Gloster, vice-president of the Court of Appeal’s civil division. North London firm Schubert Murphy claims damages for negligence and for a contribution under the Civil Liability (Contribution) Act 1978 in respect of losses suffered by the firm and its client after a search of FAS confirmed that the solicitor acting for the vendor in a property transaction was registered, as was his firm. In fact, neither existed and Schubert Murphy became the victim of a fraud. It transferred the purchase price to the fraudster after being given what purported to be a solicitor’s undertaking to discharge the vendor’s mortgage. The fraudster absconded with the funds without doing so. It turned out that the fraudster had stolen the identity of a retired solicitor with a different name. He then submitted a deed poll in support of an application to the Solicitors Regulation Authority (SRA) to amend the name of the retired solicitor to John Dobbs, then applying to the SRA first for a practising certificate, and later for approval to practise as a recognised sole practitioner under the name Acorn Solicitors in Rotherham. The client brought a claim against Schubert Murphy alleging negligence and breach of trust, which was settled by the firm’s insurer. It is now suing to recover the costs it incurred. The firm was dissolved following these events. Beatson LJ said the underlying claim raised the important question of whether a duty of care arose where information was provided by a digitised system online rather than in response to an inquiry made in person, over the telephone, or in a letter. While a regulator did not generally owe a duty of care in relation to the way it carried out its regulatory functions, he continued, making information available through the FAS facility “is arguably an additional step going beyond what it was required to do, and thus providing an additional but voluntary service”. He said: “The Law Society specifically encouraged the use of the facility to find solicitors rather than licensed conveyancers or other professionals and did not recommend any other checks. Permission to appeal was initially refused on the papers by Lord Justice Briggs, but was granted by Lady Justice Hallett after a hearing. Beatson LJ said: “I observe that, when refusing permission to appeal, Briggs LJ noted that the Law Society advanced powerful reasons why it has a very strong prospect of a successful defence to the claim but concluded that on a full appeal the court would be unlikely to reverse a discretionary decision that the issue deserved a trial. Charles Dougherty QC of 2 Temple Garden, who acted for the Schubert Murphy, said: “This is an important decision. 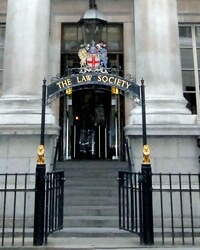 If the Law Society had been successful in their strike-out application, it would have set an unfortunate precedent: that professional and regulatory bodies could never be liable for inaccurate statements made on websites as to who is – or is not – authorised or regulated by them, however careless they were. “Conveyancing transactions require that each side is confident that the other side’s legal representative is genuine, and accordingly will be covered by insurance, or in default the Law Society Compensation Fund, if anything goes wrong.